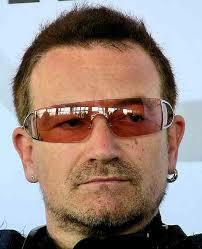 Bono, the frontman of U2, recently revealed the reason behind his omnipresent sunglasses - he has glaucoma. Due to his twenty year history of glaucoma, Bono is very sensitive to bright lights and camera flashes. For that reason, he dons his famous shades wherever he goes. You can watch the big reveal here. We admit, this clip from the British talk show, the Graham Norton Show, is not a great education source for glaucoma. But, we enjoyed the goofy British sense of humor and got a laugh from the old pictures of the band he had on hand. On the Graham Norton Show, Bono explained that he has 20/20 vision and his glaucoma was only diagnosed through careful eye exams. Glaucoma often has no symptoms until it is very advanced. Vision loss from glaucoma cannot be reversed, but early detection can prevent progressive vision loss. Take it from Bono, have your eyes checked yearly!